Bhubaneswar: Odisha ruling BJD accused BJP of maintaining double standards on Mahanadi issue. A day after Union Minister Dharmendra Pradhan condemned the statement of Chhattisgarh Chief Minister Raman Singh on the Mahanadi issue, the BJD on Saturday slammed the BJP and accused it of maintaining double standards. 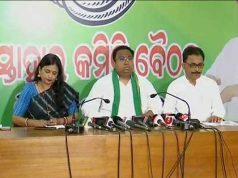 BJD vice-president Debi Prasad Mishra said the BJP leaders, including the Union Minister, are making contradictory statements on the issue to mislead the people of the State. They have no clarity on the issue. The Prime Minister during his Cuttack visit also made a wrong statement about the inter-State river tribunal. Party spokesperson Pratap Keshari Deb said the BJP has made a u-turn after its defeat in the recent by-elections and finding the ground further slipping under its feet in the State. Pradhan criticised the Chhattisgarh Chief Minister only to bail out the Odisha BJP unit out of trouble, he remarked. BJD general secretary Sanjay Dasburma said the BJD would launch its third phase of the protests over Mahanadi soon.